In this article we’ll explain how to send HTML bulk emails from Outlook 2013 or older versions, using Easy Mail Merge. As you probably know, Easy Mail Merge is an Outlook add-in designed to send bulk emails from Outlook. It creates separate emails for each recipient and it sends them one by one while also allowing you to personalize the email content using mail merge fields. It supports all Outlook versions, including Outlook 2013. With Easy Mail Merge, you can quickly import a HTML template to your bulk emails session without altering your HTML email design. To do so, all you have to do is to start a new bulk emails session (from the Easy Mail Merge toolbar displayed on your main Outlook window, click on “Start Session”), import your mailing list and then select the HTML template that will be applied to your bulk emails. Once you finish these steps, Outlook will open its email editor window with the chosen HTML design and you can further edit the bulk email content. When you are done editing your Outlook bulk email, you can configure your bulk email send options: you can choose to send all your bulk emails at once, you can choose to queue or schedule them and so on. 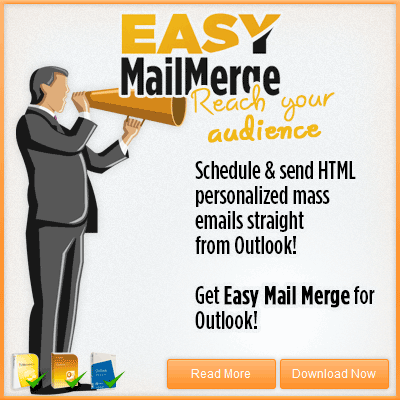 Easy Mail Merge gives you lots of bulk email send options! 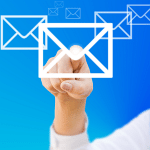 Can you personalize each HTML email automatically when using easy mail merge? Yes, of course you can automatically personalize each individual email with custom fields, such as First Name, Last Name, Company etc. All you have to do is to import these fields (from Outlook Contacts or CSV files) to your Easy Mail Merge session.